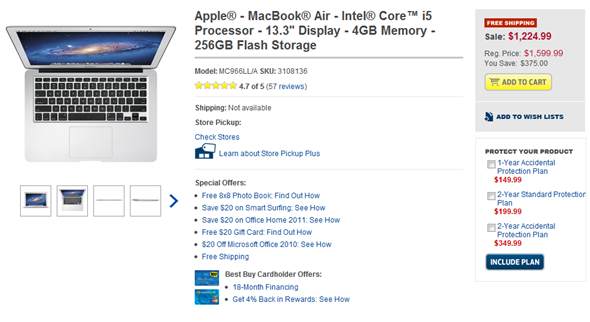 Best Buy Slashes Previous-Gen Sandy Bridge MacBook Prices By $375, Grab Yours Now Before Stocks Run Dry! Selected MacBook Pro and MacBook Air models are currently available with some considerable savings from U.S. retailer Best Buy. With up to $375 knocked off of prices, the retailer is apparently trying to clear stock to make room for Apple’s recently released product updates. Everyone likes to have a new toy to play with. Shiny new MacBooks are high on the wanted list for many of us, especially with the latest round of refreshes offering up some rather tasty MacBook Pro and Air upgrades. The problem is that they are not the cheapest things that you could covet though, and with the new top of the range MacBook Pro setting buyers back above two thousand dollars, buying one is simply out of the question for many. If you do need a new MacBook though, all is not lost because on big box retailer in the United States is offering a hefty discount on both the MacBook Pro and MacBook Air lineups which feature the Intel Sandy Bridge CPUs. Clearly trying to clear out tis inventory in order to make way for the newer models, Best Buy is offering up to $375 off selected MacBook Pro and MacBook Air models, allowing punters to pick up something of a bargain so long as they don’t mind covering last year’s models. At some of these prices, we’d be more than happy to take one off their hands! Arguable the best deal going is on the 13-inch MacBook Pro. Featuring a dual-core 1.7GHz Core i5 processor, 4GB of RAM, and a 256GB SSD, the machine would normally have retailed for $1600. Now though, you can pick one up from Best Buy for $1225. That’s plenty of power, in a super small package and with a $375 saving. You can’t say fairer than that! With Best Buy clearing out its inventory though, we suspect that this deal is not long for this world. As they say, once they’re gone, they’re gone, so if you think a cheap MacBook Pro or MacBook Air could be in your future any time soon, now may be the time to think seriously about giving Best Buy a look before they are all gone. 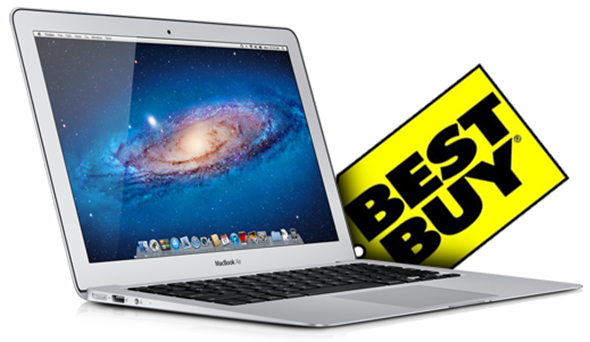 Head over to the link below and check out all the deals Best Buy is offering on previous generation Sandy Bridge MacBooks.